Strand Brewers Club | Brewing the best damn beer! There is a BJCP taste exam on 12/6, if you are able to donate beer for the exam please contact me at president(at)strandbrewersclub.com. In exchange for your donation you will receive ~24 score sheets on your beer. Many club members are taking this exam and the beers should be tasted blind, so please keep all donations confidential until after the exam. All our purchases to the club bar are complete. If you would like to sponsor one of the taps you can do so by giving a check to the treasurer or via Paypal. Sponsor tap will be commemorated with something like a plaque on the club bar (details at a later meeting). We hope to have all the club bar improvements incorporated for the holiday party. The 2015 Southern California Homebrewers Festival is on 5/2/2015 at Vail Lake near Temecula. Our club has reserved 11 sites and we have campsite managers for each site. The sites we have reserved are 313 through 323. Currently 7 sites are full and there is room for about 15 additional campers. Email me and I’ll put you in contact with a campsite manager to reserve your spot. Thanks to Bob Wilson for fielding the call and reserving the sites, and to Rick Wirsing for taking the alcohol awareness course. We had a lengthy and interesting discussion of the club bylaws, and passed two changes to the bylaws: 1) updating the bylaws to reflect the 35 dollar membership fee that was passed a few years ago and 2) increasing the maximum amount of an extraordinary expenditure to 250 dollars. Other discussion topics included membership cards, officer responsibilities, and what constituted a normal operating expense. Expect more on Club Bylaws at the January meeting. Congratulations to the 2015 officers! Ryan Penrod Brought a Saison carbonated with cardrobs at low and high carbonation levels. Jeff Sanders brought a King Harbor monster brew with cocoa nibs, one carbonated with Carb Tabs (CT)and one with Prime Dose (PD). Ryan’s low carbonation Saison was perceived to have more body and mre sweetness while the high carbonation version had a grainy character more head and perceived to be drier. Jeff’s CT had more milk chocolate flavors while the PD was more carbonated and drier and was described as having less chocolate or bitter chocolate notes. Thanks t everyone who participated. At the November meeting we are having our last single variable tasting of the year. This one is focusing on carbonation. To participate just bring any beer that you have that has been carbonated to the same level with a different method or to two different carbonation levels. Leave a comment on what you are bringing so everyone knows what to expect. I am bringing a saison that I packaged at two different carbonation levels. Great news from the California Homebrewers Association! Not only is our 2015 Homebrewers Festival going to take place, it looks like we are moving it back to beautiful Vail Lake Resorts! The event will be Saturday, May 2, 2015! At this time, CHA does not know for sure the rates for the campsites, but does know they will not be higher than their posted rates of $70 per night in The Oaks and $65 per night in all other campsites, Friday through Sunday. Keep in mind that all sites at Vail are Full Hookup sites. You are allowed up to 6 people per site and 2 vehicles. There is a $20 cancellation fee till 2 weeks prior to reservation; after that it is a 50% cancellation fee. CHA will try to negotiate a cheaper price, if at all possible, and will let us know the costs of the campsites prior to the registration. Thanks to Steve Fafard, Bob Wilson, Rick Wirsing, and Jason Light for all their help with the charts. Thanks also to Rick Wirsing for capturing and sorting all the pictures of Strand Brewers Club events this year and also to Rives Borland for putting together a solid 2013 entry for us to build off of. Also congratulations to the Maltose Falcons, this years winners. On 10/8 Strand Brewers Club held the October meeting and the 3rd Iron Brewer Competition of the year. The first iron brewer competition was coconut, special B, and Calypso hops, won by Steve Gardner, the second competition was for hazelnut victory malt and tettnag hops won by Michelle Nuemann and her assistant bottle washer Bob Wilson. This competition was coffee, marris otter and Willamette hops. Adair Johnson had a fantastic blond stout with coffee and cardamom, but Rich Thorton wan the competition soundly with a delicious coffee vanilla milk stout. Thanks to everyone who competed! Paypal is up on the website. If you have been waiting to pay 2014 dues for paypal., now is the time. Remember the homebrew demo at Jim Hilbing’s and the Octoberfest Party at Jeff Sander’s both this Saturday. Jay Ankeney is hosting a homebrew demo on November 1. Jay has registered the event for AHA’s Learn to Homebrew Day, and will be demoing the stovetop method he has used to win numerous medals at competition. Jeff will have the club bar set up and if they are ready the shirt orders will be on hand for everyone to pick up. A big thanks to Bob and Michelle for going all the way to Belgium just to bring a bottle of Cantillon to the meeting. A draft of the Anchor Homebrew Club of the Year entry was also presented at the meeting. Please email president(at)strandbrewersclub(dot)org with any recommendations or inputs you have. Jim Wilson is looking for a volunteer to administer the exam on Dec 6 so he can proctor. The volunteer must be a BJCP judge, otherwise, it’s an easy way to earn 2 non-judging experience points. At the September 2014 meeting the Strand Brewers Club voted to replace the 22 old, dinged, and beat up chrome plated faucets and shanks on the club bar with new stainless faucets, shanks, and tailpieces. With care these club bar upgrades will be the last we need for a very long time. The Strand Brewers Club is looking for donors to help offset the expense of the upgrade. Donors will be recognized with something like a nameplate on the club bar or a commemorative glass, but details are yet to be finalized. The total cost for the new stainless parts are 916.06 or 41.64 per faucet. 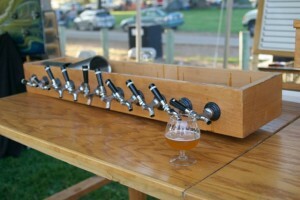 Strand Brewers Club is asking for a donation of at least 40 dollars to sponsor a faucet. You can contribute by cash or check at our club meeting, or via the PayPal button below. You can choose to contribute the estimated $40, or the actual cost of a faucet, and also choose to help out the club by including the PayPal fees we would otherwise have to cover. Three times a year, we invite club members to brew a beer with a randomly selected hop, a grain, and an adjunct. The random aspect encourages brewers to get outside their comfort zone and brew something they normally wouldn’t try. And just to keep things interesting, the club votes for a winner, who gets to host the Iron Brewer Trophy until the next winner is selected! Start planning early, and let’s get some great entries! Single-Malt and Single-Hop (SMaSH) beers offer the opportunity to strip a beer down to the bare essentials. No complicated grain bills or hop lineups! They make learning about individual ingredients easy. Mash at 154 degrees for 60 minutes. My OG was 1.050. Ferment at 64 degrees. I brewed 3 gallons of this recipe (scaling appropriately) and after one week, I split the batch into three, one gallon jugs, adding 0.5 oz of Mosaic, El Dorado and X-hops pellets, one variety per jug. I used hop bags and anticipated lower extraction than if I had just dumped in the pellets, so I used more than I would otherwise. Maybe 0.3oz per gallon would be a good amount without hop bags. I dry-hopped for one week, then removed the hop bags (but didn’t have time to bottle for another week). One thing I’d like to try is dry-hopping during fermentation. The yeast apparently interacts with the hop oils, and according to some Zymurgy article I can’t find, dry-hopping during fermentation results in stone fruit characteristics, while dry-hopping after fermentation is mostly complete results in citrusy, piny and floral notes. If you want to participate, comment below which hops you’d like to experiment with and whether you intend to dry-hop during or after fermentation.